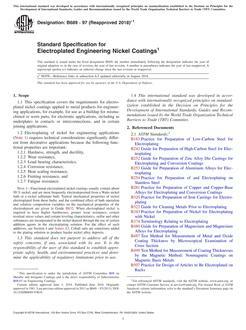 1.1 This specification covers the requirements for electroplated nickel coatings applied to metal products for engineering applications, for example, for use as a buildup for mismachined or worn parts, for electronic applications, including as underplates in contacts or interconnections, and in certain joining applications. Note 1: Functional electroplated nickel coatings usually contain about 99 % nickel, and are most frequently electrodeposited from a Watts nickel bath or a nickel sulfamate bath. Typical mechanical properties of nickel electroplated from these baths, and the combined effect of bath operation and solution composition variables on the mechanical properties of the electrodeposit are given in Guide B832. When electroplated nickel is required to have higher hardnesses, greater wear resistance, certain residual stress values and certain leveling characteristics, sulfur and other substances are incorporated in the nickel deposit through the use of certain addition agents in the electroplating solution. For the effect of such additives, see Section 4 and Annex A3. Cobalt salts are sometimes added to the plating solution to produce harder nickel alloy deposits.